Article & photos by Lenora A.Hayman. 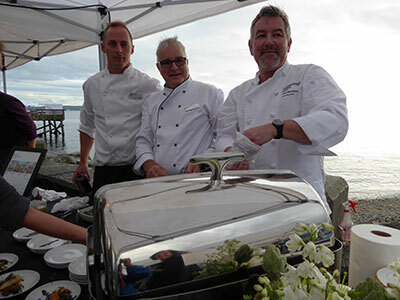 The annual Harmony Arts Festival July31-Aug.9, 2015 at Ambleside Beach in West Vancouver, celebrated 25 years of summer fun with visual arts and crafts, musical performances and culinary experiences. 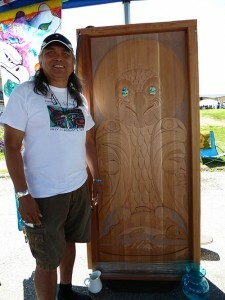 In the Art Market, Xwa lack tun (Rick Harry) from Squamish had carved a beautiful door in yellow and red cedar and abalone, paying homage to the eagle, salmon, mountain and canoe, survivors of the great flood. Also at Ambleside Park is his steel sculpture, Spirit of the Mountain, conveying the positive relationship between the Squamish First Nation and new arrivals to West Vancouver. Xwa lack tun has received the Queens Diamond Jubilee Medal and the FANS Distinguished Artist Award. Aaron Nelson-Moody Tawx’sin Yexwulla “Splashing Eagle”, known as “Splash” from Capilano Village was carving a head in marble. He also carved the entrance door for the Canada House Pavilion in Torino, Italy. 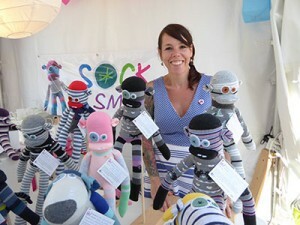 I loved Deanna Smith’s Socksmith sock monkeys, dogs, pandas, cats, and bunnies created out of new, flamboyant socks. Adults were buying them for themselves and not just for the grandchildren. Rommy Verlaan, the Lakota flute maker, www.heartsongflutes.ca demonstrated the different lilting sounds produced from both hard and soft wood Heart Song Native Love Flutes. Architect Majid Sheikh Akbari incorporated themes of spirituality and environment in his beautiful sculptures created from reclaimed wood. Bill Jamieson and Michael Anthony of Anthony Jamieson Designs, showed a doorway and shower wall with fish designs, cast in architectural glass. Peg Steley from Jewels with Attitude was promoting a fabulous travel dress, weighing only 4.2 oz. which doesn’t absorb odour, can be hand-washed and air dried in 2 hours, needs no ironing and packed into a 7” x 7” pouch! There were concerts in John Lawson Park and Garden Concerts in Millennium Park, ranging from The Fab Forever Beatles Tribute, Dal Richards’ Orchestra, The Paperboys and Bobby Bruce’s Nearly Neil. 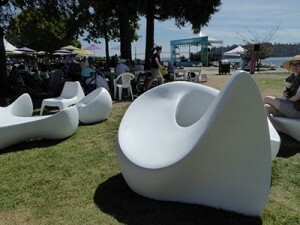 While eating a Haida Wild Halibut meal battered with 33 Acres beer from the pop-up Dirty Apron Restaurant in the Park Royal Beachside Patio, I sat down in Marie Khouri’s Art Installation “You and I”, a glamorous, white, contemporary, outdoor seating arrangement, made from expanded polystyrene, resin and fibreglass. I always look forward to the Wednesday evening Best of the West, 12 wineries, 12 restaurant food grazing on Ambleside Pier. Guests voted the PARC Retirement Living 1st place for their favorite gourmet taste of vegan wild mushroom tart with smoked chipotle and Kraus farm blackberry reduction. I liked the pairing of the 2012 Stag’s Hollow red tempranillo with the flavours of blackberry, cherry fruit and pomegranate. In 2nd place, the sweet honeyed stone fruit and citrus of the 2012 Stoneboat Vineyards Verglas partnered well with the Thomas Haas Chocolates and Patisserie oven roasted Okanagan apricot brulée, toasted almond ice cream and lemon thyme shortbread. Feast Dining received 3rd place for a delicious bbq lamb rack with smoked cherry succotash and vanilla ham hock vinaigrette and the 2011 Poplar Grove Merlot, deep maroon in colour with a bouquet of plum, dates and black cherry. The PARC Retirement Living owns 4 independent living residences, Cedar Springs PARC, Nth Vancouver, Summerhill PARC, Nth Vancouver, Mulberry PARC, Burnaby and Westerleigh PARC, West Vancouver. They sponsored the Garden Stage and invited me to join the residents there at the White Tea P arty on Thursday afternoon. We all dressed in white and were seated at tables set with white linen tablecloths and fresh flowers. We noshed on cucumber sandwiches, salmon pinwheels, ham croissants, scones filled with cream and raspberry jam and blueberry and strawberry tarts. While enjoying David’s speciality teas and sipping a glass of wine a gentleman”90 years young”, in white jacket and white shorts, was swing dancing, to the music of the Slipped Disc Jazz Band. All ages had fun!